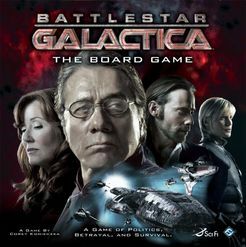 Battlestar Galactica PriceCompare, Buy this board game at the Lowest Price. The basic set-up is simple enough, thanks to the easily-comprehended instructions. Each player chooses a character (all from the show), with each character belonging to one of four classes (Pilot, Support, Military Leader, Political Leader) and having unique skills which specify what Skill Cards, players get at the beginning of each turn, and then each player is given a Loyalty Card which the players look at but do not reveal to the other players as it is these cards that dictate which players are Cylons. The playing board is a simplified map of, and the area around, the Galactica. The area around the Galactica is separated into 6 different zones where all of the surrounding traffic and dogfights will take place. It also contains the counting dials for the human resources; Food, Fuel, Population, and Morale. The main goal of Battlestar Galactica is for the Human players to survive long enough to get to their destination (Kobol), while trying to identify which players are Cylons. You know, just like the show. The means by which you do so is not so straight-forward. Players' turns are made up of four steps. First, you take your Skill Cards specified (Politics, Leadership, Tactics, Piloting, and Engineering), as determined on your Character Card. The Skill Cards are pretty much what the entire game revolves around. They have two components; an Action, and a Skill Check number which I'll explain in a moment. The second part of your turn consists of moving your character in one of two ways: if you're on the Galactica you can either move to another room, or if you're piloting a Raptor or Vipor, you can move to an adjacent sector outside the Galactica. After that, you may take an action. Each room in the Galactica has a given action that you may take or you can carry out one of the actions on one of your Skill Cards (it could be repairing damaged ships or letting another player perform out-of turn actions, for example), or if you're a pilot out on patrol you can choose to attack any Cylon ships if they are in your sector, via 8-sided-die rolls. The last part of your turn consists of drawing, and then reconciling Crisis Cards. You know those moments of every BSG episode where everything goes bananas? Crisis Cards are the board game equivalent. With the Crisis Cards, one of three predicaments usually arise: A decision will have to be made concerning some sort of sacrifice, Cylon ships will appear around the Galactica, or a Skill Check will have to be accomplished. Skill Checks from the Crisis Cards generally manifest themselves in the form of the Human players (or unrevealed Cylons) having to acquire the number of Skill Check points given in order to avoid some sort of unfortunate incident (loss of Resources, getting sent to the Brig, Execution). Now, the cards are all thrown in face down, and then shuffled before being added up. The main obstacle in completing a skill check is the fact that you can only throw in the determined types of Skill Cards. By adding up the aforementioned Skill Check number of the cards you determine whether or not you have successfully passed the crisis. However, if there are any cards that are not of the desired skill set, they count against the Skill Check. This is how an unrevealed Cylon can muck up the works. The Skill Check cards are thrown in face-down and then shuffled so as to maintain the anonymity of which player threw in which card. The cards are revealed and the Skill Check points being tallied, determining the success of the Skill Check. After the main component of the Crisis Card is completed, some Crisis Cards contain symbols at the bottom that relate a Cylon action of some sort (movement, deployment, or attack), and/or a symbol allowing the Humans to further the preparation of the FTL Jump drive. Once the FTL is ready, the Humans can "jump" closer to their destination. If they reach Kobol, HUMANS WIN!! HUMANS WIN!! But if the Humans run out of any one of their Resources, they succumb to the will of their Cylon offspring. The biggest strength Battlestar Galactica has going for it is how much it plays out like the show; more than any other TV or movie based game that comes to mind. Events that come up in the game are very similar to those that came up in the show. Decisions and choices that need to be made are very relevant, and the longer you play, the more stressful they get. Everything about the game is aesthetically appropriate and the attention to detail, whether it be in game-play, rules, or game pieces is pretty fantastic. If there are any negatives to be found, they are in the simple logistics of playing. You need a lot of space, and a lot of time. Of the handful of games that I've played, the shortest game was still over 3 hours. If you don't have a lot of room to play, it will become pretty frustrating (doubly so once you start using expansion sets). The only other negative that might come into play is if you aren't familiar with the series at all, but if that was the case, then you probably aren't even reading this right now anyway. Battlestar Galactica is an iconic piece of nerd culture, even though its original roots may not be that strong. The fact that the game is very respectful and true to the series is always apparent, as it is that this was not just something that was thrust upon the fans in an effort make money off of a Cable TV flavor-of-the-month. Game Developer Corey Konieczka really put a lot of time and care into making the best product possible, and his hard work is clearly on display in every facet of the game. Now, a couple of expansions have been released (Pegasus and Exodus), and all that needs to be said about those is that they definitely enhance the game and make it much deeper than it already is. Be that as it may, the core game is a great tribute to the series while being a lot of fun. It also gives you great insight into which of your friends you can count on once our alien overlords finally make themselves visible and wish to exterminate us. Battlestar Galacitica is a fantastic board game that's very true to the show, provided you have 3 or 4 hours to play. Find the lowest price of your favorite board game.